Euphyllia ancora also commonly known as the Hammer corals or the Anchor coral. They are one of the famous large polyp stony coral in the hobby. Hammers are extremely popular. They appeal to both the beginners and experienced hobbyist for their aquarium. Euphyllia is widely found in the Indo-West Pacific and Indonesian region. They are called hammers due to their t-shaped or anchor tentacle tips. Their colors vary from yellow, green, tan and more exotic ones have orange, white and mixed colors. Hammer coral’s tentacle tips are visible throughout the day light and at night it hides away in its skeleton. Under blue actinic lighting their tentacles glow which is mesmerizing. They are hardy so with proper water parameters in the aquarium they thrive. They are aggressive and can sting other corals. Euphyllia ancora are differentiated as branching and walled which is due to their skeletons. The branching hammers are like a branching tree. As they get bigger its branches out in different directions. The wall hammer has one skeleton and just keeps getting longer and longer. 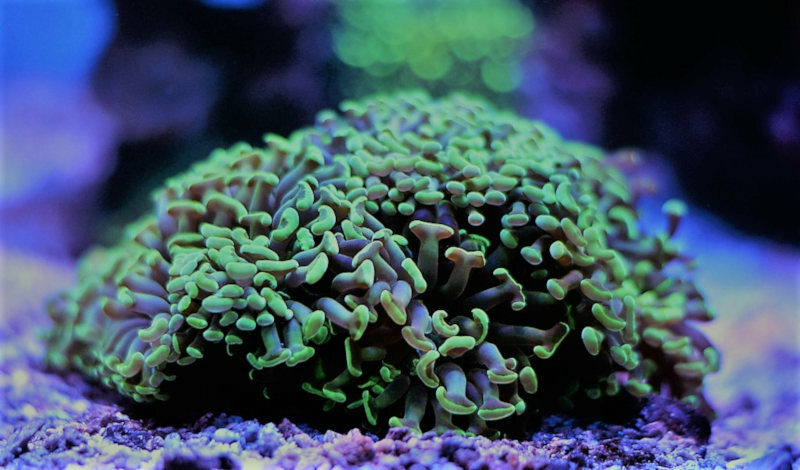 Euphyllia ancora live the best in moderate lighting and require calcium, strontium and trace elements. For feeding its best is to feed them every week in from of meaty food and micro-plankton food. In our country keeping or trading stony corals is not allowed so if you find one it will be in the black market. The cost would be quite high depending on the color and size. As per the IUCN Red List these corals have the status of vulnerable, so the best is to go for aquacultured and grown deliberately for the hobby.